With each passing day, Scott Carey weighs less and less, however, he continues to retain mass. What will happen if he hits zero? That’s not Scott’s only problem, either. A young lesbian couple next door walk their dogs every day in front of Scott’s home only to have the dogs relieve themselves on Carey’s front lawn. He’s tried to reason with them, but they’re having no part of Scott’s efforts to establish a neighborly relationship. At seventy-one, Stephen King isn’t showing any signs of slowing down. 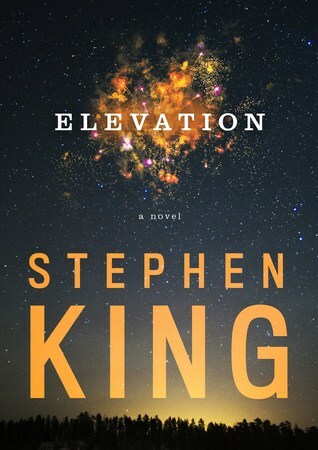 Elevation – although a novella – is the second book he’s released in 2018 and while it’s better than its predecessor The Outsider, it’s pretty forgettable. King has been a vocal critic of President Trump and has often commented on the deep political and ideological divide plaguing his country, so I can understand why he felt the need to write a story about folks coming together despite their differences. However, Elevation felt over-simplified with thin characters in a paint-by-numbers plot. To put it simply, it seemed like an after-school special with an ending wrapped up with a bow. I think what bothered me the most was the sudden change in attitude by the townspeople – these are long-held, deep-seated convictions that are seemingly altered by one event. For a story like this, you’re going to need more time. It just didn’t work in less than one hundred and fifty pages. You’re also talking about Castle Rock here – people are off their rockers in this hole of a town. Maybe I judge King more harshly than most authors but why not? He’s written some of my favorite stories, so he deserves to be held at a higher standard. If it were up to me, and I was his publisher, I believe Elevation belongs in a short story collection, maybe as an opening novella. I’m not sure this deserves its own release.